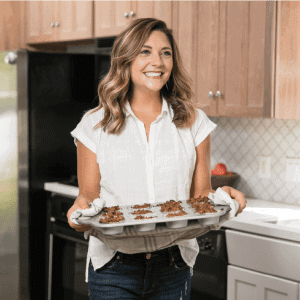 Since announcing my plans to pursue my dreams and go back to school to become a Registered Dietitian Nutritionist (RDN) I have received several e-mails asking about the details of my program. Because of this, and because this blog follows a good portion of my life I have decided to share the details of my program on the blog in hopes to help answer a few questions many of you have! Find a program that works for you (I am enrolled in a Distance Dietetics Program that I complete online). Complete the necessary requirements for your program and apply to your program. Get accepted into your program and study nutrition! These posts may get a bit lengthy, so I thought I would break the information up into a series of three posts centered around the steps involved to becoming an RDN. Why I chose a distance learning program and finding a program that is right for you. Pros and cons of being a distance student or a student online. There are several options when it comes to nutrition programs. After ultimately deciding that I wanted the nutrition science-based education of a Registered Dietitian Nutritionist, I then had to figure out which type of dietetics program was the best for me. The Academy of Nutrition and Dietetics has a list of all of the programs on their website. All of these programs are divided into two categories: Coordinated or Didactic. If you complete a didactic program, you must also apply for and complete a Dietetic Internship. The coursework and the internship are separate and applications are independent of each other. In my perfect world, I would have applied to a coordinated program. Being realistic, I knew that I had a few things to consider: Brian was still in school and we were applying to orthodontic residency programs all over the country for him, and I didn’t want to wait until Brian was complete with school for me to go back to school. These factors pointed me toward a Distance Dietetics Program (DDP) which is a type of didactic program. The DDP was (and is) a great option for me because I could complete the program wherever Brian got into school and I could maintain flexible school hours allowing me to work part time. started looking at necessary prerequisites for each program, talking with faculty in each program, looking at the curriculum for each program, and looking at the cost of each program. After e-mailing with the schools and getting a feel for the personality, the University of Northern Colorado felt like the perfect fit for me. I really enjoyed communicating with the school, and everything just FELT right. Not only that, but it was the most budget-friendly option. If you are considering going back to school for nutrition, here are the takeaways I have for you. Check out the programs listed on the Academy of Nutrition and Dietetics web site. Make a list of things that you need to consider and things that are important to you in a dietetics program and make note of schools that fit these needs. Begin reaching out to schools to get to know the faculty and get a better “feel” for the school. Start a spreadsheet on excel or google drive listing each potential school and things needed for the application process (including prerequisites). Hopefully this post is helpful to those considering going back to school for nutrition or for those who have already decided to go back to school and are trying to decide which program is the best choice. 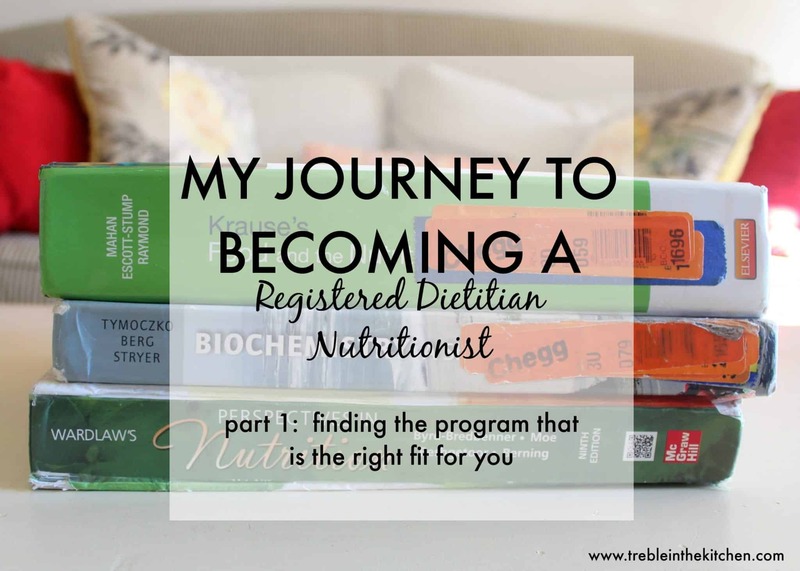 I’ll be posting my second installment in my “journey to becoming a Registered Dietitian Nutritionist” series soon, but until then please feel free to e-mail me or comment below with questions. I am always happy to respond! Do you have to be a dietetic technician before you can start a didactic program? Hi Sheena! Please email me at trebleinthekitchen@gmail.com 🙂 I would love to help! This post was super helpful and I look forward to reading similar ones! I’m currently a sophomore in college and on the nursing tract, but I also have a huge interest in nutrition and pursuing a career as a dietitian. The more information, and testimonies from others who have/are going through the process, the better! Thanks, Whitney!! I have one more year of didactic (coursework) and then I apply for my Dietetic Internship next year at this time. Yikes!! How exciting that you begin rotations!! 🙂 I am in a clinic a bit this semester too. So far, I’m loving it! Great post! So funny I’ve been thinking a lot about writing about the same thing! I came from a non nutrition background (business) so it was definitely a different path! You should totally write about it! So exciting! Good luck Tara! I had an intern from there once! Good luck in your program! Thanks, Anne!! And thanks for all of your guidance at the very early stages of my decision making process! Great post! I did my Masters in Health Promotion and Education mostly as online classes because my husband’s job moves us around every few years so I can definitely relate. That sounds so similar!! Online classes really are pretty darn amazing. Thank you SO much for posting this and your future posts! This year I’ve decided to change majors at get my batchlers in nutrition and the school I’m going to has different concentrations within the nutrition major, one of which would end up being a coordinated program I see. I’m still not really sure what exactly will happen, but I knew this is the new path I’m taking as an undergrad! You are welcome Rebecca 🙂 Glad you enjoyed it!! Good luck with the new path!!! !